It's no secret, I'm a fan of Clint Bellanger's Heroine Dusk™. A while ago I made remixed versions of the monsters, but the titular heroine had been left undone. I actually did have an attempt at editing the original sprite at one point, but somehow I couldn't get her charm to carry over with my changes. So for this one I started from scratch. She has 6 different armors and 6 weapons, just as the original sprite does. 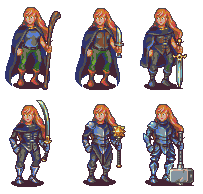 Like the other sprites, she is drawn with the dawnbringer 16 color palette. Edit (2/26/2015): Made some updates to the base, changed the paperdoll components to fit. Hope to expand this someday, but since it hasn't been used since I uploaded it as far as I can tell I can't prioritize it like I'd like to. Love it! Very nice character work. I think one day we'll see a total conversion mod that uses this and your monsters. Excelent work as usual Red !! You're always very good ! normally i am not a pixel art fan. but this character is winning me over. Amazing work. Thanks for uploading this.